This visualization depicts a valley and several houses before and after a flooding event. It shows how accurate heights are needed to understand how water flows across the land. Just a few inches of inaccuracy in measuring the height of the location of a house, for instance, could mean the difference between a flooded and a dry home. Learn more about the use and importance of geodetic datums in this National Geodetic Survey video. Suppose you are buying a new home that is located near a river that routinely floods. During the buying process, you learn that you are required to have flood insurance. A step in the process of obtaining this insurance is to get a certified elevation of your new home from a professional surveyor. Wouldn’t it be easier (and cheaper) to simply provide your insurer with the elevation of your home? After all, it’s relatively easy to get this elevation information right from your mobile smartphone. NOAA's National Geodetic Survey defines and manages the National Spatial Reference System — a consistent coordinate system that defines latitude, longitude, height, scale, gravity, and orientation throughout the United States. In addition to a network of continuously operating reference stations supporting three-dimensional positioning activities (shown here), the reference system includes a network of permanently marked points; a consistent, accurate, and up-to-date national shoreline; and a set of accurate models describing dynamic, geophysical processes that affect spatial measurements. National Geodetic Survey survey technician Justin Dahlberg collects gravity measurements aboard NOAA’s Gulfstream IV aircraft, shown in top image, over the Hawaiian Islands in February, 2019. More Accurate Height Measurements: Coming Soon. Scientists at the National Geodetic Survey are working on a 15-year-long project to make accurate height measurement better, faster, and cheaper. This project is called the Gravity for the Redefinition of the American Vertical Datum, or GRAV-D for short. When it’s done in in 2022, you will be able to get accurate heights to within about an inch for most locations around the nation. Measuring Heights Will Be Easier Than Ever Before. Not only will height measurements be more accurate, people will be able to more easily keep those measurements up-to-date and better predict how heights may change in the future. The improved model for measuring accurate heights will also be tied into GPS, so it will be easier and faster than ever to get accurate height information. Better Heights = Billions Saved. A recent study estimated that this update will lead to about $4.8 billion in social and economic benefits to the U.S. through improved floodplain mapping, coastal resource management, construction, agriculture, and emergency evacuation planning. Accurate Heights Reveal Which Way Water Flows. In low-lying coastal areas, accurate height information is critical for knowing how water will flow across the land for many applications, like monitoring levee heights, maintaining safe hurricane evacuation routes, creating more accurate floodplain maps, and managing coastal development as sea levels rise. Accurate heights are also needed to maintain efficient water delivery and drainage systems and to help reduce urban and agricultural runoff and water pollution. 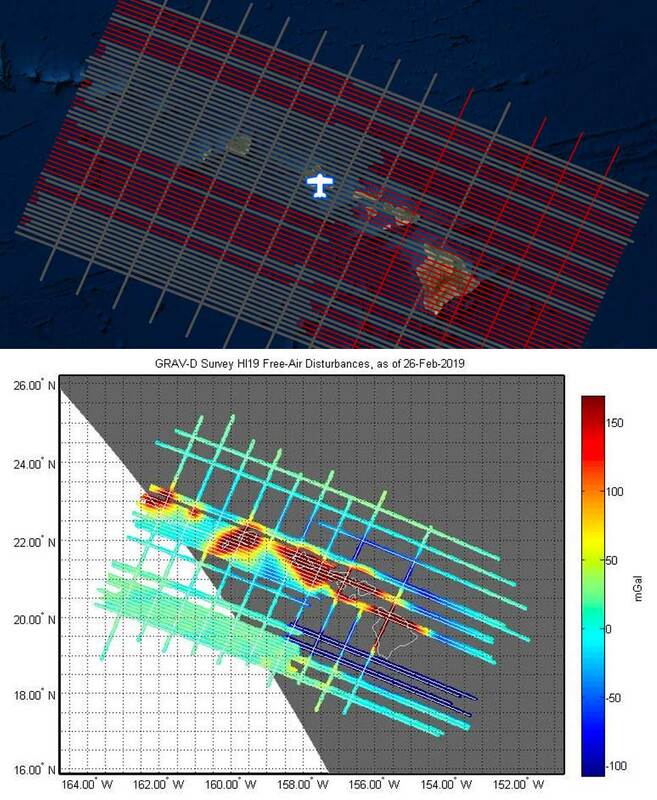 The top image above is a map of a grid flown by NOAA’s Gulfstream IV aircraft to survey the gravity field over Hawaii in February, 2019. While the aircraft flies back and forth in a grid pattern, a NGS scientist aboard uses scientific equipment to survey the geopotential for the entire state and surrounding coastal ocean. The complex process of geodetic leveling that measures geopotential is a measurement of height times the change in gravity at a given point. Gravity has to be accounted for when taking elevation measurements because the Earth's gravity field varies from point to point. These variations affect how water flows. The grey lines are completed flights, while the red lines show where the plane has yet to fly. The bottom image shows the resulting partially-completed gravity survey map for Hawaii.